This should mean that the badge should no longer be achievable now given that first month of documentation ended in late August. The badge was awarded from July 21, 2016 to August 20, 2016 which is the first month of documentation. Yet today I see that two more users were awarded this badge on December 13th 2016 and December 19th 2016. How did that happen? This happens when users merge accounts. We always merge accounts into the lower user ID, which isn't always the user that has the badge they've earned. So when the merge is complete, they'll receive the badge again the next time the process runs that awards it, which records the new date that they earned the badge. 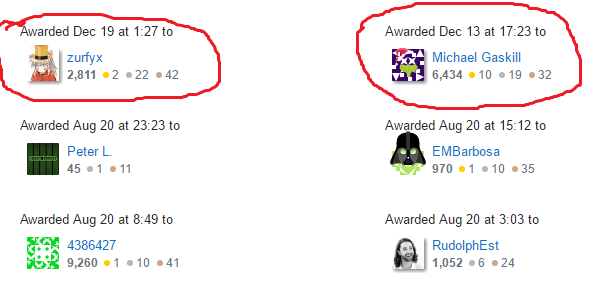 Hint: You can usually spot when a merge happens because the user will have a long list of badges all awarded on the same day. Not the answer you're looking for? Browse other questions tagged support documentation badges . What are the specific requirements for the Documentation badge Bluebook? How to earn the Documentation Pioneer badge? Why I am not getting the Copy Editor badge?